Update: Over 2 years later (August 2014), I still come across this problem. This time, the error code was 0x8004ff19, but the solution was the same: delete "%PROGRAMFILES%\Microsoft Security Client" and re-install with the current installer. It seems that there is a pretty bad problem with Microsoft Security Essentials. I was surprised to notice that it wasn't running on several machines. It turns out that an automatic upgrade through Windows Update fails in a very bad way: it sort of uninstalls the old version, and then fails to install the new version. Users don't notice anything special. An error has prevented the Security Essentials setup wizard from completing successfully. Please restart your computer and try again. Of course, clicking on the "Get help" link is of no help at all. Apparently, the code "0x80070005" means "Access denied", but there is no way to find out to what the access was denied. Description: Installation Failure: Windows failed to install the following update with error 0x80070643: Microsoft Security Essentials Client Update Package - KB2691905. Description:Cannot complete the Security Essentials installation. 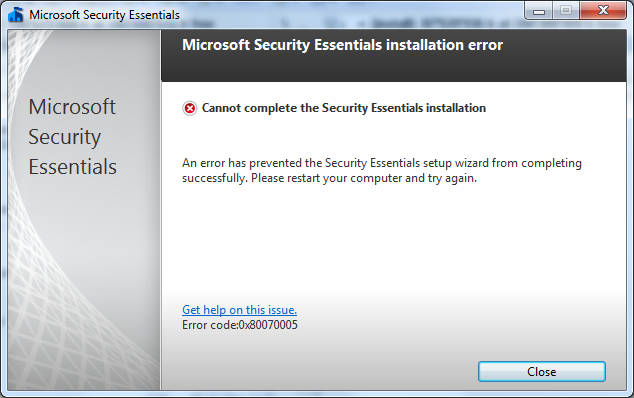 An error has prevented the Security Essentials setup wizard from completing successfully. Please restart your computer and try again. Error code:0x80070005. Access is denied. Description: Activation context generation failed for "c:\program files\microsoft security client\MSESysprep.dll".Error in manifest or policy file "c:\program files\microsoft security client\MSESysprep.dll" on line 10. The element imaging appears as a child of element urn:schemas-microsoft-com:asm.v1^assembly which is not supported by this version of Windows. rmdir /S /Q "%PROGRAMFILES%\Microsoft Security Client"
After that, I could re-install normally. But it is very disturbing to see that an antivirus can just stop working without any obvious alert or user notification. Thanks! Finaly! It realy works! I'm in IT more then 10 years, and must admit, that most solutions from Microsoft is absolutely useless. Hate them! After wasting hours trying Microsoft's 0x80070005 solutions I try your fix. WOW,MSE working again. Thank you. You are a Legend. Geoff C.
Looks like when installing Security Essential, a folder "Microsoft Security Client" will be created in Program Files under C drive . If the folder is already there, the installation will be aborted with this error message. Wow! Why isn't this the top result on Google for this error? Lots of useless information to dig through first. Why the presence of the folder causes the installer to crash and burn makes no sense to me. This is almost certainly a bug in the installer and should be fixed. Thanks a bunch. Your solution fixed my problem after hours of searching Microsoft and running the typical useless FIX-IT utilities to no avail.